It was a close race. This goes to show that Cain should have gone to the NCAA. Hunter will likely face the same situation as a pro in a couple years. The difference is that Hunter makes half a million over 10 years regardless and mary cain faces massive performance reductions. Or so letsrun has told me. I hope it is much more than half a million over ten years. That doesn't seem like enough to sacrifice NCAA opportunities. I would have skipped college for that. I ended up going into real estate anyway, and didn't even use the degree. I could have purchased a bunch of houses and been set for life at that point. It's half a million over 10 years GUARANTEED + all college tuition paid for + all of the prize money/bonuses out there. Leave her alone you big bullies. She's still a teenager and accomplished more in her life so far than you ever will. If Mary had gone to college she would have experienced the same slow down and then her prospects of a contract would have been zero. As it stands, she's banking money. If she can turn the ship around, the money will keep coming. If not, she can decide if she wants to run for fun or hang them up. Competing in the NCAA would not have done anything for her. I guarantee no way Drew Hunter got 5 million guaranteed. ($500k for 10 years). But I do find it interesting that Hunter likely makes way more than Andrews. Cain's agent is Ricky Simms. I'm sure she got a good deal. How is he worth so much??? I've barely heard of him. Has he even been in non-running news like Webb was on Letterman? Was he competing at the Olympic Trials? It's the new "discus". You can join us now and be one of the hip guys or you can oppose it and eventually go home devestated. They must have been so in shock by the result they couldn't think straight. 3s slower than at the trials. Definitely devastating. Damn that is a fine woman! 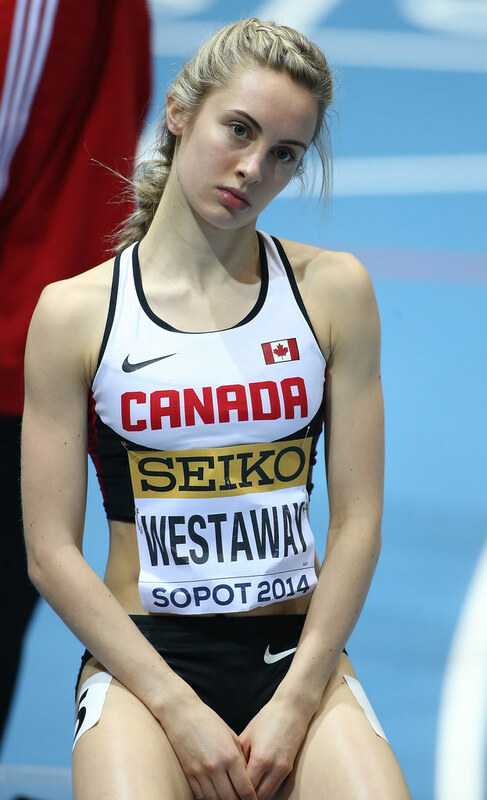 Westaway has a 201 800m pr I believe. Her 1500m pr is close to the 416 she ran here I'm pretty sure. At least Cain managed 2nd and challenged ftw. Not terrible by any means. I didn't see the race but .83 is a decent margin of victory. At 4:16 pace that is 4.86 metes or nearly 16 feet.